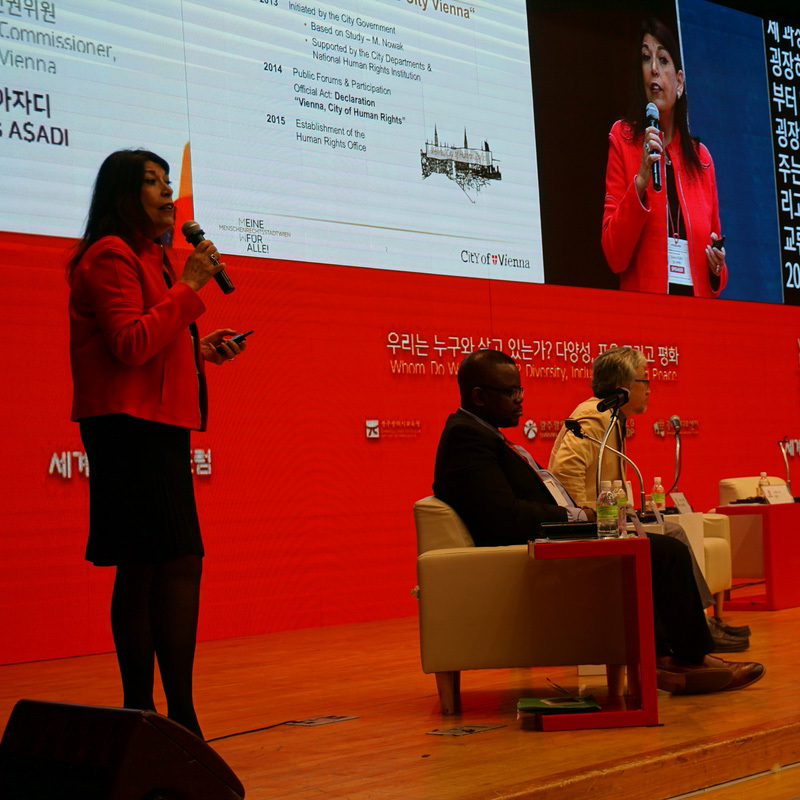 From 18 to 21 October, our co-chair city of Gwangju hosted the 8th edition of the World Human Rights Cities Forum: a paramount event for the international human rights cities movement co-organized on a yearly basis by our Committee and the Gwangju International Centre. On this year edition, the Forum focused on the issue of diversity and the Right to Peace, articulating meaningful local commitments in favor of inclusive policies in regards to migrations. The Forum was also a key opportunity to explore new alliances towards a 2030 agenda for human rights in the city. The World Human Rights Cities Forum has been held on a yearly basis since 2011, in commemoration of Gwangju’s Democratic Movement of May 1980. On this significant date, citizens of Gwangju rose against the military regime in the hope of achieving the democratization of Korea. That movement spread to other Asian countries in the 1980s and 1990s and Gwangju is now a symbolic place for Human Rights in Asia (the Asian Human Rights Charter was for instance adopted in Gwangju on 1998). 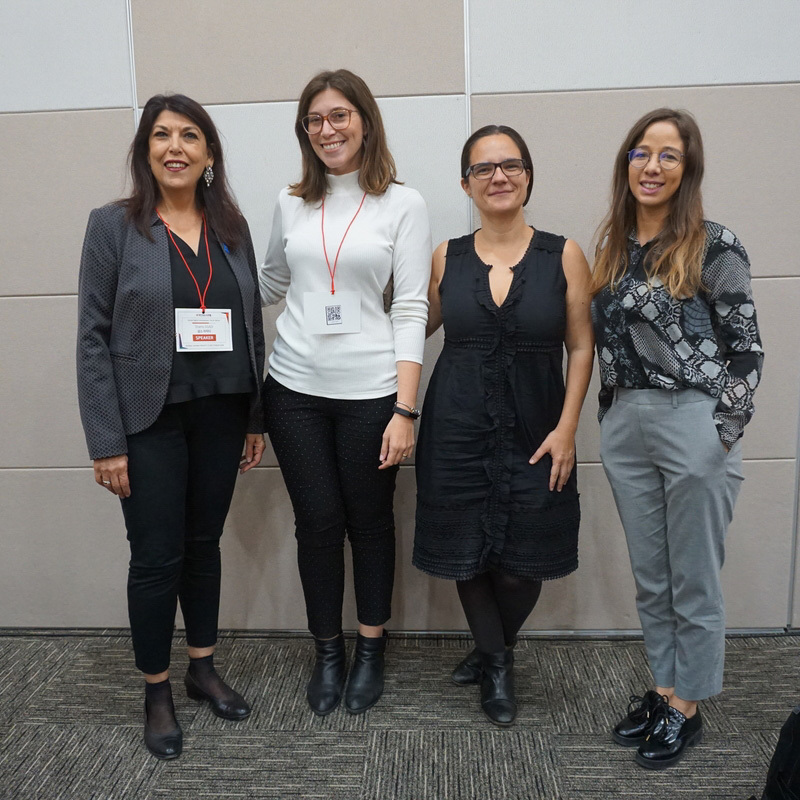 Held under the theme “Whom do we live with?”, this year’s edition was focused on exploring ways by which local governments engage with diversity and migration. On the occasion of the Forum’s plenary session, representatives from various local governments highlighted the need to build inclusive cities towards migration, able to guarantee human rights universality. City representatives from Vienna, Barcelona, Amman or Sao Paulo brought their experience on this subject throughout the Forum, sharing with the audience concrete policies on employment, participation, refugee integration, interreligious dialogue or language training. It should be noted how this discussion takes place once UCLG’s Wave of Action on migration comes to an end next December with the adoption of the Global Compact on Migration. During the Forum, local government representatives such as Grigny Mayor and President of the French Association of Mayors for Peace (AFCDRP) Philippe Rio also brought their experience to the table in regards to the Right to Peace and the Right to the City. Other local and community leaders stressed the need to consider the participation of specific communities in policymaking, such as indigenous peoples, LGBTI or people with disabilities. This action plan was further explored throughout 9 thematic sessions focused on gender, social economy, elder people, youth education, people with disabilities, environment, migrants and refugees, state violence and peace. Springing from the outcomes of these debates, the Forum’s Final Declaration recognized “the global commitment to human rights as the basis of peaceful coexistence of human beings and as the key to stop discrimination against minority groups and conflict among different races, people and religions, and move toward the inclusive society”. The 2018 edition of the Forum gathered speakers from Korea and Asia, but also from other world regions such as Europe, the Middle East or the Americas. As a partner organization, our Committee organized a local government delegation formed by representatives from Amman (Ismail A. F. A. Bustanji, Deputy Mayor), Barcelona (Aida Guillén, Human Rights and Diversity Director), Grigny (Philippe Rio, Mayor and President of the French association of Mayors for Peace), Sao Paulo (Andrea Zamur, Coordinator of policies for migration) and Vienna (Shams Asadi, Human Rights Director). Partner organizations also attended the Forum, such as John Paul Cruz from World Enabled, Mugiyanto from INFID or Lawrence Kwark from the Global Social Economy Forum - GSEF. 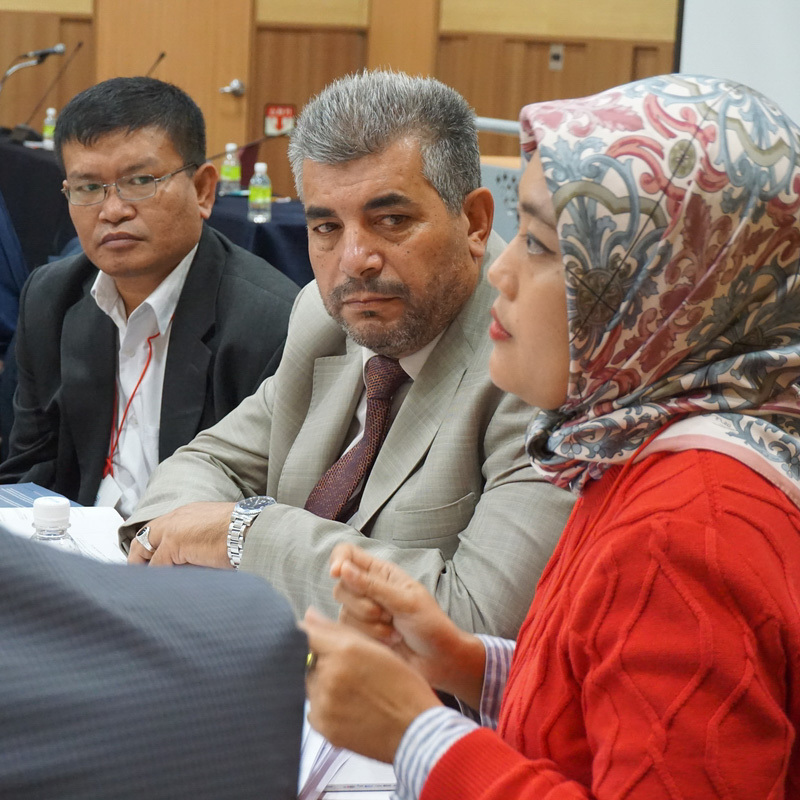 This WHRCF edition also counted with the participation of Raoul Wallenberg Institute for Human Rights Director Morten Kjaerum and UCLG ASPAC Secretary General Bernadia Irawati. On the other hand, our Committee facilitation was key to achieve the participation of Deputy High-Commissioner Gilmore from the UN Office of the High Commissioner for Human Rights (OHCHR). The participation of Deputy High-Commissioner Gilmore marked a clear step forward towards the international recognition of local governments’ role in the promotion and protection of human rights; key cornerstone of the advocacy strategy led by our member-local governments since 2015. 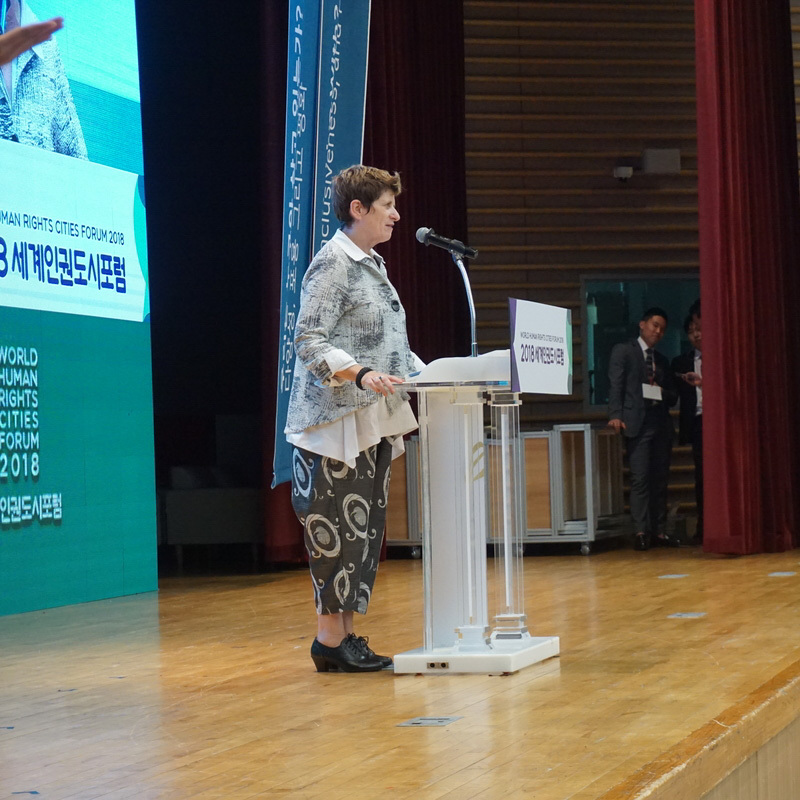 As keynote speaker of the Conference, Ms. Gilmore thanked the city of Gwangju and the human rights cities movement for their initiative and for providing hope in standing up for human rights. She also noted how, on the 70 anniversary of the Universal Declaration of Human Rights, the OHCHR is launching a global call to “Bring Human Rights Home”, in worldwide cities and human settlements. Ms. Gilmore intervention provided a strong follow up to last September's resolution by the Human Rights Council on the subject of “Local government and human rights”. This resolution asks the OHCHR and other relevant stakeholders to interact and reinforce dialogue with local governments worldwide, equally encouraging the interrelation between agendas on human rights and Sustainable Development Goals. Ms. Gilmore was able to meet local government delegates from our Committee during the Forum, exchanging ideas and points of view towards the reinforcement of partnerships on human rights cities networking. She also exchanged meaningful talks with our co-chair, Mayor Lee Yong-Seop from Gwangju, who warmly received all participants to the Forum in a Welcoming Dinner in front of the City Hall. Almost one hundred participants took part in the Human Rights Cities Network session held on the 19th, which was conveyed to explore ways by which the international human rights cities movement could engage with other global agendas, such as Sustainable Development Goals localization. 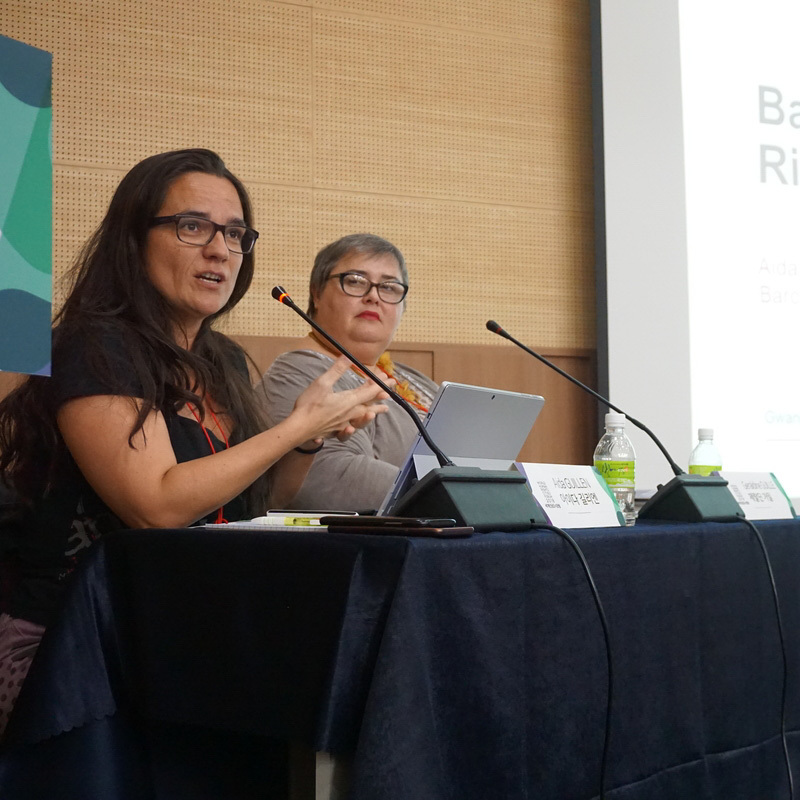 On this occasion, Committee delegates were able to present inputs on the basis of their priorities and experience, and the city of Barcelona was invited to present its own local experience in human rights mainstreaming during a Policy session organized by the Raoul Wallenberg Institute. This expert group is set to meet regularly in coming years towards adopting a “2030 Gwangju Agenda for human rights cities” following the example of Gwangju, which is already engaged in SDGs localization. 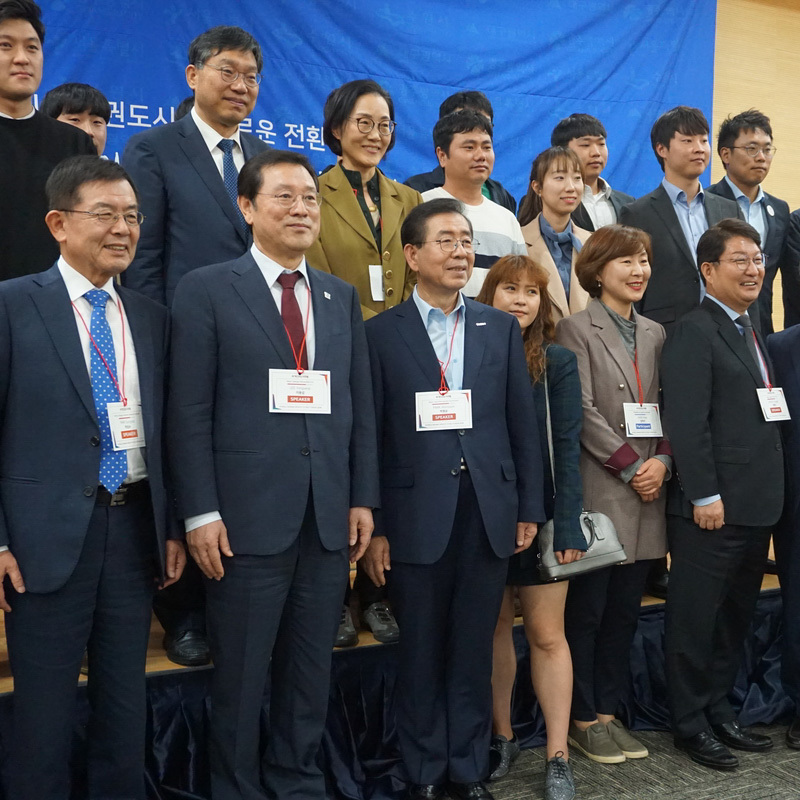 The WHRCF 2018 was also marked by the participation of “Human Rights Mayors” from some of the largest cities in Korea. 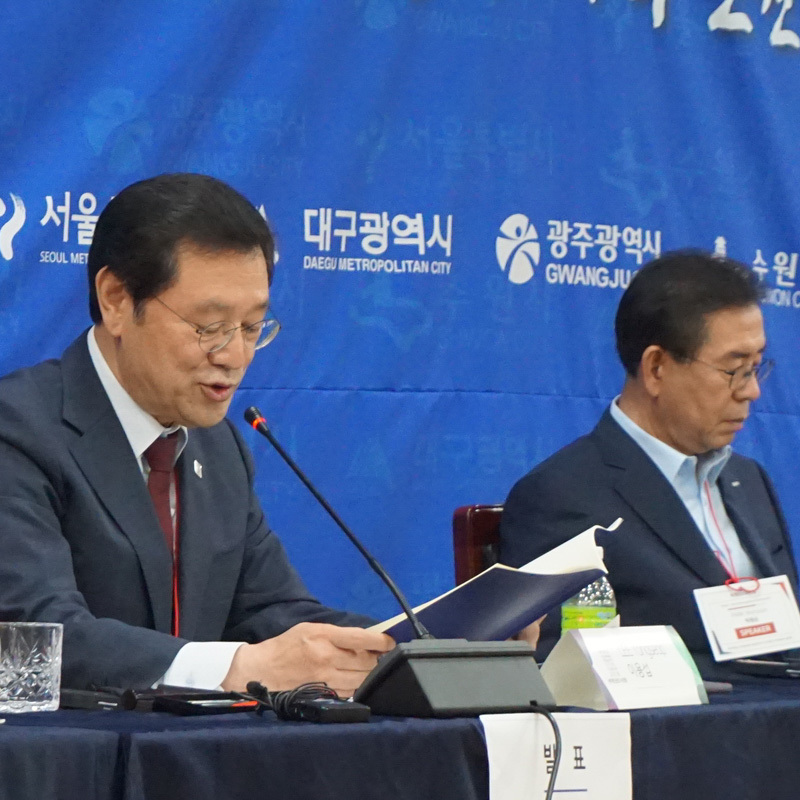 As a matter of fact, a historical session held during the second day of the Forum gathered Mayor Lee Yong-Seop from Gwangju, Mayor Park from Seoul, Mayor Kwon from Daegu and Mayor Yeom from Suwon, among many other local and civil society representatives. In his intervention, Mayor Park from Seoul encouraged local governments to engage in favor of human rights, inviting his colleagues to go further in issues such as gender equality or the protection of minorities. Mayor Park also highlighted how local governments have been at the forefront in defending the right to housing as shown by the initiatives “Cities for Adequate Housing”. On the other hand, Mayor Lee Yong-Seop from Gwangju reaffirmed his city’s commitment in favor of human rights and promised to go further on issues such as job creation and labor rights, social justice or citizen participation. 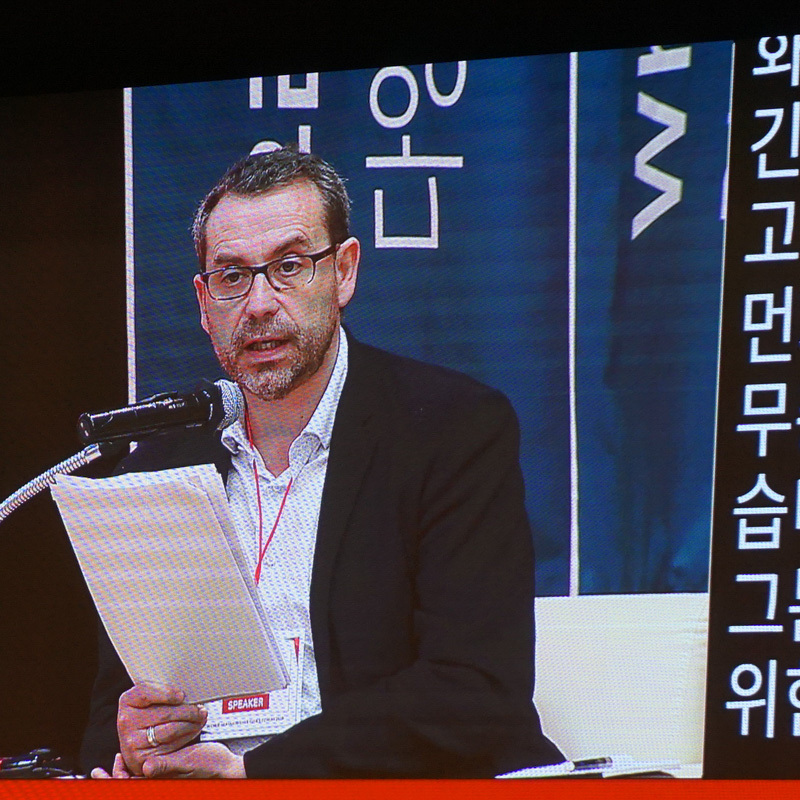 Gwangju is committed to host the Forum once more in the near future in order to consolidate the city as an international meeting point for the Cities for Rights movement. 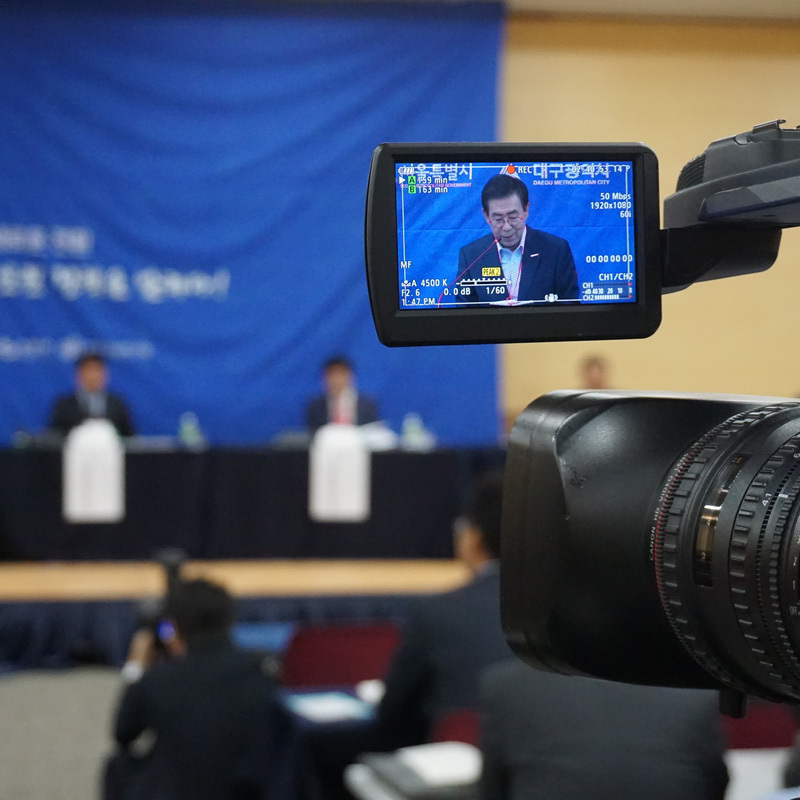 Indeed, this engagement had a concrete translation at the national level, with a strong representation by national government representatives, the National Human Rights Commission of Korea and the Development Aid Agency of Korea (KOICA), which is set to become an official partner of the Forum.